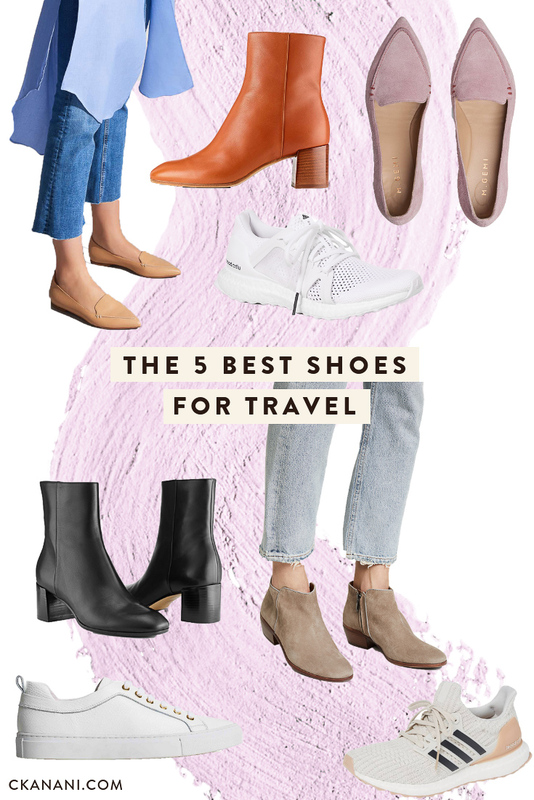 If you are on the hunt for the best shoes to travel in, you have come to the right place! As someone who walks a huge chunk of the day everyday (both while traveling and also while home in San Francisco), I definitely consider myself an expert on the subject. When it comes to shoes I find it very important to invest in quality. This is especially important when looking for shoes to take traveling because the last thing you want is to have to head back to your hotel because your feet are sore or torn up. I will often leave my hotel for sunrise and not return until after dinner so shoes that have all day walkability is a must. In addition to quality, I also find versatility to be incredibly important. Most of want to pack as lightly as possible so the more outfits a shoe will work with, the better. They also need to be good looking and fashionable. I am not someone that will settle for function over fashion. Luckily, thanks to my finds below, I don’t have to! If you don’t already own shoes from M. Gemi you are truly missing out. They are Italian shoes “made the old way, sold the new way”. What does that mean? They are luxury shoes handmade in small, family-owned Italian workshops, sold directly to the consumer. They have new drops every Monday and most styles are limited edition so once they are gone they are gone! M. Gemi shoes are certainly not inexpensive but THEY ARE WORTH IT! I own at least 8 pairs of their shoes and almost never buy other brands now. The Corsa boot is one of my all time favorites so I was thrilled to see that they are back again this year. As someone who generally hates wearing flats, I love the shockingly comfortable 2.15” heel. The Corsa is ankle height, goes with everything (jeans, skirts, dresses), and has all day walkability — what more could you want? I have been living in the black suede pair since Fall 2017 and hope to pick up another pair this year. I’m especially loving the mocha suede, natural suede, and animal-print. FOR A LIMITED TIME, USE CODE “CHRISTIE40” FOR $40 OFF YOUR FIRST M. GEMI ORDER! If you follow me on Instagram then you already knew this was coming because I cannot shut up about these shoes. I never ever travel without them and truly love them — maybe more than any other shoe I have ever owned (honestly). White sneakers are great in general because they are incredibly versatile. You can wear these with literally anything — jeans, leggings, skirts, dresses. I do not believe in wearing athletic (workout) sneakers with jeans but these are fine for that. Prior to buying M. Gemi’s Palestra sneaker (convincing my mom to buy them for me for my birthday, actually) I tried just about every other good looking white sneaker on the market. Converse, Vans, Keds, you name it, I tried it. What I quickly found is that they needed a lot of time to be broken it, after which they’d still be uncomfortable after half a day, and they quickly fell apart. The Palestra sneakers, on the other hand, are handmade so they are SO COMFORTABLE. I did not have to break them in at all. And they can be worn all day everyday. I just ended a two-month-long travel spree where I lived in these more often than not yet not once did my feet hurt. Not to mention they are the most beautiful sneakers I have ever seen, with artisan-treated leather and gold metal eyelets. The top is sewn to the bottom (vs. glued like all of the cheaper brands do) adding an extra touch of sophistication. Truly cannot recommend these enough! UPDATE: I love these shoes so much that I now have a full blogpost dedicated to them! Click here for the most comfortable and stylish shoes for travel. Another can’t-live-without shoe, the Sam Edelman Petty boots! These have been around for years (and re-stock year round) and I personally own them in four colors (seriously). These are my everyday shoes — I’ve probably spent about 50% of my life in these over the past few years. I love them because they aren’t flat, but with just a 1.75” heel they are still incredibly comfortable. I hate running so I can’t run a marathon, but if I did I’d probably run it in these. Thankfully she threw in the last bit because once I saw the price point I was a bit hesitant. I really loved the look of them so I decided to try them out anyway and OH MY GOODNESS they feel like you are walking on clouds. I have since bought another pair of Adidas by Stella McCartney UltraBOOSTs plus one more pair of regular old Adidas UltraBOOST (without the Stella McCartney name). I find the Stella McCartney ones to be much cuter, so if that is of importance to you then check them out. They sell incredibly fast and can be very hard to find so swipe them up as quickly as you can. Every single time I wear mine at least one person stops me to ask me who makes them. If you want to save ~$50, the non-Stella McCartney ones are just as comfortable. All Ultra Boost shoes offer a “full-foot boost™ midsole for superior energy return and just-right, trampoline-like cushioning”. I have never come across a more fantastic sneaker. I do not yet own the M. Gemi Stellato Saccetto yet but I have had my eye on them for a year. If you are looking for a fully flat shoe for travel that is not a sneaker, I would go with these. According to the site they have all-day walkability and the reviews definitely back up that claim! As with everything above, they are incredibly versatile and go with a handful of different outfit types. I’m hoping to snag the dusty pink suede or natural leather ones this season. If you have a favorite pair of travel shoes, please leave me a comment! I would love to find some other favorites.